Collage makes onboarding super easy! We gather all of the information that your company requires in one place. No more printing off and keeping track of a bunch of different forms. Now with our new in app tax form feature, you can fill out and sign your tax documents right in Collage. When you first start your onboarding process you will be asked to sign some documents. This will include any documents your company has requested you read, fill out, or sign. Including your tax forms! The first step to completing your tax forms is to fill in the required fields. To fill out a text field, click it and start typing. To move between the different fields, you can hit enter, or select tab on the left that says Next. To move to the next page, hit enter when at the bottom of the page, or select Next > on the top right. Simply click on the box to place a check mark. On the last page of your form you will notice a section to sign your forms. 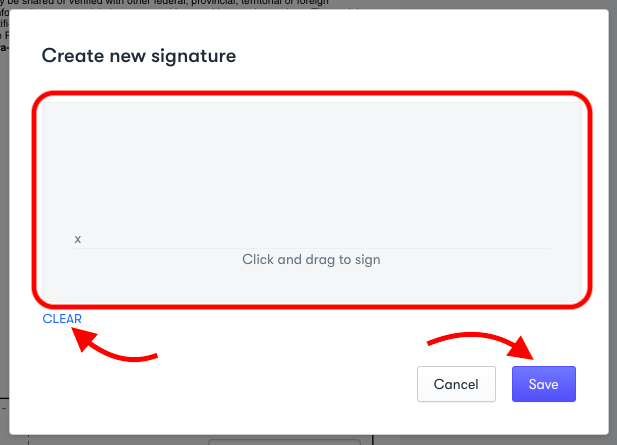 To sign it, Click on the signature box, and a pop up should appear for you to sign using your mouse or track pad. Then click save. Don't like the way you signed, click clear. This will add a signature to any signature boxes on the current page. Once you have clicked Complete, you will be brought to the next document you need to fill out. Once all of the documents have been completed, you will be moved on to the next step in the onboarding process.